This is a really good, tangy salad. The onion can be grated into a fine pulp that coats the tomatoes beautifully. It's perfect for a summer afternoon with a piece of crusty bread to mop up the juices. Nigella Lawson's recipe. Serves 4. 1. Chop the shallot and garlic as finely as is humanly possible – or just blitz to a pulp in a processor – and put in a small bowl with the oil, a pinch of salt and a grinding of pepper. 2. Leave to steep while you blanche the tomatoes: that’s to say, put them in a large bowl then pour boiling water over them so that they are hotly submerged. Leave for 5 minutes then tip into a colander and run under cold water. 3. Using a sharp knife, peel off the skins then cut these fuzzy spheres into slices, as thick or as thin as you like. 4. Arrange the tomatoes in a dish and pour over the dressing, using your fingers to mix well. I find it easier to use one bowl for steeping purposes and another one, later, for serving. You can let the tomatoes sit like this for a good couple of hours while the flavours will deepen wonderfully. 5. When you’re ready to eat, either leave the dressed tomatoes in the bowl or decant to a new one but turn them to coat, squeeze over some lemon juice, sprinkle with Maldon salt and a tablespoon or so of freshly chopped coriander and splash with olive oil. Note: even if you're too lazy to peel the tomatoes (these photos clearly implicate me), the salad is still very good. This recipe, using Fuyu persimmons, is a delicious breakfast or a wonderful autumn afternoon dessert. 1. Arrange in a bowl. How simple is that?! And the best thing is that it tastes sooooo good. This cocktail is a perfect summer afternoon thirst quencher. The flavours make me think of the American south and, since today is my last day in New Orleans, it couldn't be a more fitting farewell to our little vacation. Tomorrow Jonas and I will fly home to the cold winter weather and our jobs. Sigh. 1. Remove stone from nectarine, then add to blender with all other ingredients. 2. Process until puréed and serve in tall glasses with straws. Stay tuned for my posts on my experiences in New Orleans, I'm sure there will be plenty to share with everyone. This is another post I wrote and scheduled before Jonas and I left Australia for our US vacation. Today Jonas and I should be arriving in New Orleans to feast on Creole cooking, quench our thirst on a myriad of cocktails and meet up with a whole lot of American bloggers through the oh so conveniently timed Tales of the Cocktail festival. I can’t wait to report back on all the goodness! My brother had even been born in the States (and didn’t have Australian citizenship) and yet he hadn’t been back since he was two years old. My father was in heaven, introducing us to the treats of his childhood: root beer floats, peanut butter cups, chilli dogs and, of course, beef jerky. You can’t buy beef jerky in Australia, or at least you couldn’t until a few years ago. Lately it’s appearing at petrol stations and cashier counters, but most Australians are disgusted by the chewy, dried meat. I love it. From the first bite I knew I’d found something wonderful. I love it almost as much as pickled sausages, which I would crawl over hot coals for. So when Dad bought a smoker and started making his own beef jerky I was very happy. His jerky is softer and moreish, better than store bought versions. 1. Combine all ingredients well. Marinate meat for 2 hours. 3. Lay meat on wire rack of smoker. Smoke for 15-20 minutes. The meat will have shrunk and will still be wet. 4. Preheat oven to 140’C. 5. Place smoked meat on wire racks and dry out for approximately 20 minutes. 6. Keep beef jerky in the fridge. In the wee hours of the morning, after 26hrs of travelling, Jonas and I will have arrived in Daytona Beach (Florida), ready to celebrate the day in the humidity and heat with my aunt, cousin and 90 year old grandfather. Jonas is over the moon because it’s the first time he will visit mainland USA and we’re spending the day at the Daytona NASCAR . . . on Independence Day. In preparation for this momentous day, I preblogged this WHB post with an American flavour. What’s more American than peanut butter? And combining it with chocolate? And add to this combination some banana? Even better! Thus you have Maggie Beer’s peanut butter pie with David Lebovitz’s roasted banana ice cream. Delicious! The ice cream has the most delectable flavour of sweet, caramelised banana but it's best eaten on the day of making as it can get a little icy if left too long in the freezer. The pie is divine, but it's very rich and fudgy. The filling would be overwhelming but paired with the ganache topping it takes on a wonderful cheesecake salty-sweet-sourness. Don't be tempted to use smooth peanut butter, the crunchy texture is necessary. Recipe by Maggie Beer in Delicious Magazine March 2009. Serves 16. 2. Process biscuits in a food processor until crumbled. 3. Add melted butter and sugar then pulse to combine. Press crumbs into the base of a 22cm spring form baking tin. 4. Bake base for 10 minutes then set aside to cool. 5. For the filling, place the cream and sugar in a saucepan and simmer on low for 3-4 minutes, stirring until the sugar dissolves. 6. Chop the cream cheese then blend with peanut butter, in a food processor, until combined. 7. Add the warm cream mixture, pulse to combine and then spoon filling onto the cooled cookie base. Set aside to cool. 8. To make the topping, combine the chopped chocolate and butter in a heatproof bowl. 9. Bring the cream almost to the boil over high heat then pour over chocolate and butter. 10. Leave for 3 minutes without touching then gentle swirl the bowl to combine the cream, butter and chocolate. 11. Pour the combined topping over the filling then chill in the fridge, uncovered, for 4 hours until set. 12. Serve small slices with ice cream because it’s very, very rich! Recipe from The Perfect Scoop by David Lebovitz. Makes 750ml. 2. Slice the bananas into 2cm pieces and toss them with the brown sugar and butter in a 2 litre baking dish. 3. Bake for 40 minutes, stirring just once during baking, until the bananas are browned and cooked through. 4. Scrape the bananas and the thick syrup into a blender or food processor. 5. Add the milk, granulated sugar, vanilla, lemon juice and salt, and purée until smooth. 6. Chill the mixture thoroughly in the refrigerator, then freeze it in your ice cream machine according to the manufacturer's instructions. Note: If the chilled mixture is too thick to pour into your machine, whisking will thin it out. Banana would be an all-too-simple choice of ingredients for WHB, so I’m going to focus on peanuts. Did you know they aren’t actually nuts but legumes? Yet another wonderful food gift from the abundant Americas, it’s amazing to think what our meals would like without this vast continent. The Americas gave the world pecan, avocado, cashew, passionfruit, turkey, pineapple, chocolate, pumpkin, quinoa, guava, papaya, strawberries, vanilla, allspice, potato, tomato, chilli and maple syrup. Despite having come from South America, the peanut’s journey into the USA came from Africa through Portugal and Brazil. Apparently our domesticated peanuts have two sets of chromosomes from two different species, leading scientists to believe domestication occurred in Argentina or Bolivia. The oldest peanuts found by archaeologists are some 7,600 years old, making them a pretty old fashioned snack! China leads world production of peanuts, followed by India and then Nigeria. The next largest producers of the top ten are the United States, Indonesia, Myanmar, Argentina, Vietnam, Sudan and Chad. Peanuts are a rich source of protein, niacin (good for the brain) antioxidants, resveratrol (anti-aging), vitamin B3, vitamin E, magnesium, folate, dietary fibre and monounsaturated fats. Interestingly, peanut allergies are exacerbated by roasting peanuts. The roasting process increases peanut allergens Ara h1 and Ara h2 and inhibits the necessary digestive enzymes. In other countries like India and China, where peanuts are not roasted before processing, allergies are very rare. Whatever the cause, peanut allergies are extremely dangerous and can cause immediate anaphylactic shock just by eating food processed by machines that touched peanuts or by breathing peanut dust. So that's it from me. Head on over to our WHB host, the lovely Laurie from Mediterranean Cooking in Alaska and Happy 4th of July! Apologies for disappearing again! After recovering from the inner ear virus, can you believe I contracted a cold and was knocked out for another 3 days! Looks like I might have given it to Jonas too. Despite it all, tomorrow Jonas and I are flying off to the USA for 2 weeks. The first week we’ll be in Daytona (Florida) with my grandfather, aunt and cousin and then the second week we’ll kick back in New Orleans (Louisiana). Even though the present winter in Sydney is more like spring, the sultry humidity of the South is going to be a shock to our senses. Visiting New Orleans will make Louisiana my 28th state. Somewhere between a father from LA, grandparents from Pennsylvania, family in the south-east and south-west states and doing my own time in NYC, I’ve managed to see a fair whack of the US. Now, first off I have to apologise for the quality of this buffalo wing photo. The reality is that once these suckers were out of the oven then feeding frenzy was on and I was lucky to get this crappy shot. The blue cheese dip didn’t even get a photo before wings were submerged. So, ignore the unappetising happy snap and just imagine these glorious little suckers in your belly! I have to say, making these in Australia was somewhat expensive. The chicken wings are very cheap, but Louisiana-style hot sauce is a rarity in Australia. Given that I am totally addicted to the stuff and it’s impossible to come by (and therefore expensive), using so much in one dish made me squirm with discomfort. It was like throwing beluga caviar on baked beans. But I persevered and the results were well worth it. I even set aside some of the sauce for Jonas to marinate his tofu in and he was overjoyed with the results. These are not my recipes, but a Recipe Road Test from Elise from Simply Recipes. Recipe by Elise from Simply Recipes. Serves 4. 1. Cut off wing tips (discard or reserve for other use such as making stock). Cut wings at the joint. 2. Put chicken wing pieces in a plastic bag. Set aside. 3. Create a marinade by stirring together the melted butter, hot pepper sauce, paprika, salt, cayenne pepper and black pepper. 4. Reserve 2 tablespoons of the marinade for coating after the pieces come out of the oven. 5. Pour remaining marinade over the chicken pieces in the plastic bag. Seal the bag and let marinate at room temperature for half an hour. When marinating is finished, discard marinade and bag. 6. Place wing pieces on the rack of a grill pan. Grill 4 to 5 inches from the heat for about 10 minutes on each side, until chicken is tender and no longer pink. 7. Remove from oven and baste with reserved marinade. 8. 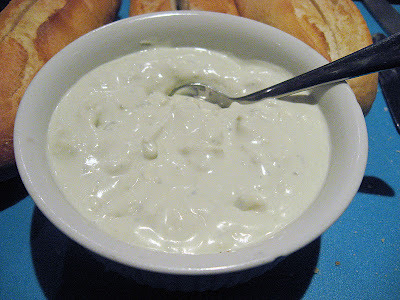 Serve with Blue Cheese Dip and celery sticks. Makes approximately 24 pieces (about 12 appetizer servings). Recipe by Elise from Simply Recipes. Makes 1.5 cups. 1. Combine dip ingredients in a blender or food processor. 2. Blend or pulse until smooth. 3. Cover and chill. Keeps for up to one week in fridge.